As a specific yoga form, Kripalu yoga largely follows the established principles of an older Hatha yoga form. Hatha, a combination of the Hindi words for sun and moon, is a kind of opposite-energy yoga where the duality between opposing elements form symbolism that informs the yoga practices. Some also call Hatha a joining or yoking yoga. Its foundations include the "eight limbs" of conventional types of yoga, all of which coordinate to provide the participant with a kind of road map to elevated mind-body connection, and some of the health benefits generally attributed to yoga. In addition, those who know about the specific kinds of practices in Kripalu yoga describe it as an inquiry based yoga form that promotes active thinking on and off of the yoga mat. Participants explain that Kripalu yoga promotes certain types of self-awareness that exist both during and in between yoga sessions, though perhaps in different forms. The majority of yoga styles include primary attention to a collection of "asanas," or postures. Some types of yoga treat these as a sequential series, and others treat them more as a blended, flowing pattern of posture. Kripalu yoga includes much of the same focus on these asanas, with teachers helping students to correctly practice each of the poses to their best ability. In addition to some of the actual physical health benefits individuals get from practicing a range of postures, many of those looking to start a yoga routine are also looking for ways to deal with the stress of their daily life. Others are looking for solutions for positive thinking to combat a wide range of mental health concerns such as depression, anxiety and hyperactivity. Kripalu yoga can be a good choice for sustaining an individual in their quest for a healthier life both in mind and body. Look for elements of this yoga discipline in local classes or training options, as well as text and video materials, where individual beginners can choose yoga styles that they believe will be best for their mental, physical and spiritual needs. Kripalu Center for Yoga and Health had its beginnings in 1966 when Yogi Amrit Desai founded the Yoga Society of Pennsylvania, a nonprofit organization providing yoga classes and training for yoga teachers. The name of the Society was later changed to Kripalu Yoga Fellowship ("Kripalu"), the nonprofit and charitable organization that still operates Kripalu Center. Yogi Desai came from the small village of Halol in India. There, from the age of 15, he enjoyed a close personal relationship with his guru Swami Kripalvananda, for whom Kripalu Center is named. Swami Kripalu is more commonly referred to as Bapuji, or "beloved grandfather." He was a highly renowned master of kundalini yoga as well as a moving speaker, prolific writer, and talented musician. Bapuji spent four years in America (1977-1981) where he taught and practiced intense yoga and meditation. His teachings still serve as the foundation of Kripalu's approach to yoga and spiritual life. The facility that now houses Kripalu Center was originally built as a Jesuit seminary in 1957. Kripalu purchased the property in 1983 and countless hard-working residents renovated it into a comfortable yoga and spiritual retreat center that opened its doors to guests on December 1, 1983. The 1980s were a time of growth and expansion for Kripalu. The number of full-time residents increased to 275. 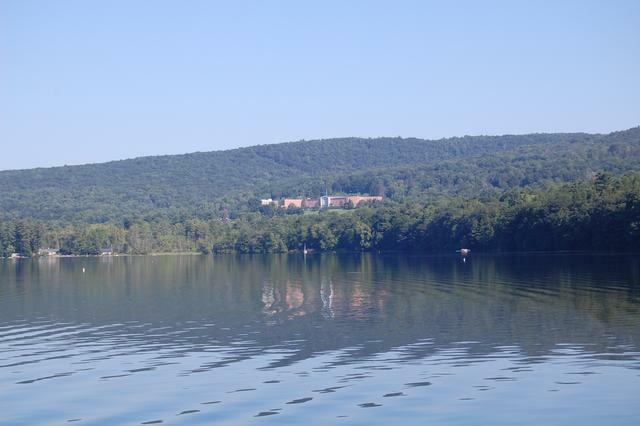 Over 10,000 guests visited Kripalu each year. In 1988 Kripalu formalized its legal status as a spiritual and volunteer organization modeled after the Hindu yoga ashram. In 1994 Yogi Desai resigned as spiritual director of Kripalu. Kripalu is the first traditional yoga ashram founded on the guru-disciple model to transition to a new paradigm of spiritual education. This paradigm is designed to provide tools that help individuals access their inner wisdom and find support for their ongoing process of growth and spiritual development. Kripalu honors all traditional and contemporary spiritual teachings that support the individual's direct experience of Spirit. In 1893, the original 100-room mansion was built on what is now Kripalu’s property by entrepreneur and banker Anson Phelps Stokes. 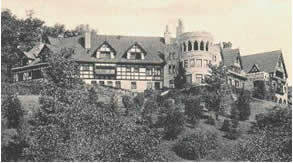 The home was situated on what is still called the Mansion Lawn, the level area surrounded by stone walls easily visible along the East Drive. With a façade that measured 410 feet, the house briefly held the record as the largest private dwelling in the United States. The grounds of Shadowbrook were designed by world-famous landscape architect Frederick Law Olmsted, known for his design of Central Park in New York City. Spencer Shotter, a wealthy turpentine magnate, purchased the mansion and 350 acres in 1906. During the Shotter ownership, Shadowbrook was leased for a time as a summer resort hotel, and also rented to Mrs. Gwynne Vanderbilt. In 1917, steel magnate Andrew Carnegie purchased Shadowbrook as his summer retreat. A local newspaper, The Berkshire Eagle, wrote: “Mr. Carnegie wanted a quiet place where he could meditate upon his unsuccessful efforts toward world peace after World War I.” In 1922, after Carnegie’s death, his wife sold Shadowbrook to the New England Province of the Society of Jesus for use as a Jesuit novitiate. Shadowbrook blossomed as a hub of Jesuit educational activity, with generations of young men studying and practicing in the huge mansion. Tragedy struck in 1956 when Shadowbrook was destroyed by fire and four Jesuit fathers perished in the flames. The Jesuits decided to build anew, not on the same site, but just down the hill. In 1957, the present Shadowbrook structure was completed, a mammoth brick building with hundreds of individual rooms, a central chapel, and many classrooms. While the Jesuits imagined that their novitiate would continue to grow, the 1960s brought sudden social changes and declining enrollment. In 1970, due to rising costs, the Society closed Shadowbrook’s doors. Standing vacant for 13 years, the property was briefly considered as a location for a state prison before Kripalu purchased it in 1983. The building needed extensive work, and the accomplishments of Kripalu residents included the cleaning and repair of 694 windows, the installation of two acres of carpet, and the painting of seven acres of wall space. Shadowbrook opened its doors again as Kripalu Center for Yoga & Health on December 1, 1983, ushering in a new era of Shadowbrook history. Kripalu and Shadowbrook continue to flower today in the Berkshires as a program center and educational organization dedicated to uplifting the physical, mental, and spiritual well-being of individuals and society.